The first person to submit for grading one of the 2019 "America the Beautiful" Lowell National Historical Park quarter-dollars with a West Point mint mark will receive a $5,000 reward from Professional Coin Grading Service (www.PCGS.com). "PCGS applauds the United States Mint for the unprecedented placement of a West Point mint mark on a limited number of circulating coins to support 2019 National Coin Week, April 21-27, and promote collecting. 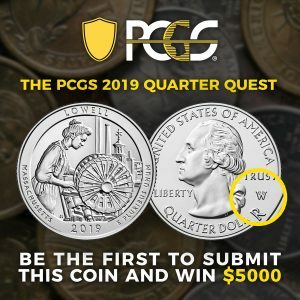 To celebrate, we’ve launched a quarter quest by offering $5,000 to the first person to submit a 2019-W Lowell quarter to PCGS for grading and encapsulation," said PCGS President Brett Charville. "The West Point mint mark on a relatively small number of America the Beautiful quarters is an exciting concept that is virtually unheard of in the lifetime of most of today’s collectors. Imagine, you can have the chance to pull a circulating rarity directly out of your change, submit it and add it to your collection," Charville stated. "The first qualifying 2019-W Lowell quarter certified by PCGS will be attributed with a unique pedigree of PCGS First Discovery. Any qualifying 2019-W Lowell quarter submitted within the first week after that First Discovery will receive a First Week of Discovery pedigree. Also, after the First Week of Discovery, any qualifying 2019-W Lowell quarter certified within 45 days after the First Discovery will receive an Early Find pedigree," explained PCGS Director of Marketing Heather Boyd. "By minting and then placing scarce West Point quarters into circulation, the United States Mint is allowing anyone the opportunity to collect rare coins from their pocket change. PCGS is happy to help collectors commemorate their early discoveries with special encapsulation labels and the chance for one lucky submitter to get a unique pedigree and $5,000 reward," stated Charville. Since its founding in 1986, PCGS experts have certified over 41 million coins from over 100 different countries with a total market value of over $34 billion. For information about the company’s products and services, including how to submit your coins for authentication and grading, visit www.PCGS.com or call PCGS Customer Service at (800) 447-8848. Yup…here we go…there is now a “bounty” out for the first W quarter to be submitted…and if that doesn’t create a stampede, there are still other “consolation” labels available…now all we have to do is wait for that press release from PCGS! Don’t worry, Mike Mezack The “king” of coin collecting has got this one!!! Repeat Repeat its already in the bag!!! Too Late!!! These are already showing up on Ebay. What a surprise…they are from one of the big dealers. So these are also coming in rows. Or are the banks the ones putting them in rows? Kinda reminds me of Willy Wonka and the quest for the golden tickets! Link on this page shows two already found. Neat PR stunt though.